In spite of the number of mutilations that we've seen along the length of our country, we have never witnessed what a cattleman who visited the UFO Museum had to show me. It's a horse -- not just any horse, as it was a wild colt that no one could tame. However, it appears that someone managed to do so. On October 1, 2007, in the Moscas Sur District, Department of Uruguay, separated from Rosario del Tala by the reiver bearing the same name, Mr. Edgardo Raul Slootman of the San Diego ranch found one of his colts in the manner shown in the photograph that appears above.Regrettably, this photo is not perfectly clear, as the gentleman did not have the negatives and it was only possible to take a photo of the photo. But as it is nevertheless important, I ask that you concentrate on what it shows: on the animal's neck, and toward the bottom, it is possible to see some collar-shaped lines caused by some element that stripped the colt's flesh as it slid threw. These lines end in a sort of fungus that multiplies as it becomes larger. This is something we had never seen before, and it truly concerns us, as the subject of mutilations appears to be changing directions little by little. These events have never ceased to occur since 2002. Another interesting detail is that cellphones would shut down whenever their users approached the animal's carcass. The conclusion is that a liquid slid down the colt's neck. It is totally corrosive and peeled the animal's hide as it did so. 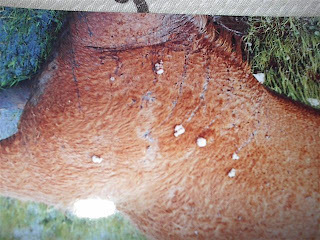 This cattleman's horse herd occupies a 90-hectare spread, and four or five mutilated cows were found that same day. What makes the UFO Museum wonderful is the willingness of the public to bring us their evidence and eyewitness accounts. We are enormously grateful for this, since as occured in this case, we obtain information that was completely unknown in the cattle mutilation phenomenon. Our sincerest thanks to Mr. Slootman for his cooperation.